Do you often experience a sore jaw or chronic headaches? Maybe you have difficulty chewing, speaking or yawning because your jaw clicks or pops? You may have a TMJ disorder. The temporomandibular joint connects your jaw to your skull on either side of your face. When it functions incorrectly, it can lead to a diversity of complications. Dr. Candace Bruno has the solutions you need to improve your quality of life with TMJ therapy in North Austin. She can stop your pain to give you the relief you need. Your temporomandibular joint is similar to a hinge. It allows you to move your jaw up and down while also providing limited side-to-side movements. There are times when the joint may function incorrectly, such as from the stress of grinding your teeth or an injury to the jaw. No matter the cause, it can create a variety of challenges in your daily life. It is common to have jaw pain and tenderness, as well as headaches. Many patients report to experience a clicking, popping, or grating sound when opening or closing their mouth. In some cases, your jaw may even lock into an opened or closed position. The symptoms of a TMJ disorder are not just limited to the jaw. You may experience ear pain or ringing in the ears. Pain can also radiate down your neck or shoulders. Your dentist in North Austin, Dr. Bruno performs a comprehensive consultation to create a customized treatment plan. Besides a visual examination, she also uses the insight of digital imaging to view your oral structures in their entirety. 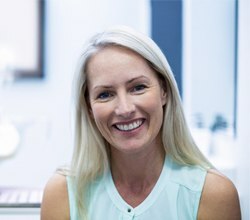 She understands the unique relationship between your jaw, muscles, and other oral structures to create a harmonious balance to stop your discomfort. Depending on your individual needs, Dr. Bruno may suggest making minor alterations to your teeth. This allows your bite to be adjusted to help your jaw fall into a more natural position to take unnecessary strain off the joints. She may also suggest the use of an oral appliance. Although it looks like a mouthguard, it serves another purpose. It is custom-crafted to reposition your jaw into a more natural position to take pressure off it. Over time, your jaw is retrained to stay in that position to give you permanent relief. Besides dental treatments, changes at home can also improve your symptoms, such as stress-relieving exercise and eating softer foods. There are many simple exercises you can use at home to improve the strength and flexibility of your jaw. If you hear clicking and popping when you open or close your mouth, you do not need to live with the discomfort. Dr. Bruno uses the latest advancements in dentistry to give you the relief you need. She will stop your pain and improve your jaw’s function using a treatment plan catering to your individual needs. Contact Bruno Dental today to schedule your consultation for TMJ therapy.